The Police in Lagos said they rescued a commercial s*x worker from a client in a hotel room, following an attempted murder. 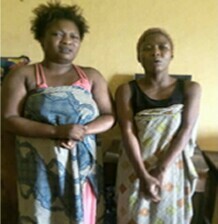 The state Commissioner of Police, Mr Imohimi Edgal, said that the police prompt response to distress call from a worker at Wellwood Hotel, Ajangbadi, Lagos led to the rescue of the lady and arrest of the man. CP Edgal said: “On the May 24 at about 12:35 a.m, a distress call was received from Wellwood Hotel. The duty officer that night at Ilemba Hausa Division, quickly went to the hotel where he found one Faith, a commercial s*x worker, with severe injuries on her neck. “The victim claimed that on same date at about 12:15 a.m., the suspect came to her hotel room. After sleeping with her, he brought out a rope, tied it around her neck and pulled her down. “He also tried to suffocate her by blocking her mouth and nostrils with a pillow. She was, however, rescued by a staff of the hotel who heard noise in her room as she struggled for life. The CP said that the suspect was yet to tell the police his motive for attempting to murder the victim. In a similar development, a 25-year old man was also arrested for luring a lady to a hotel in Lagos, where she was drugged and r*ped. CP Edgal said that the suspect invited the victim to De-Didos Hotel on March 4 where the crime was committed. “The youths should be wary of those luring them with promises of gift and better life..."